Yellow diamonds are rare, fancy colored diamonds that are exquisite when set into an engagement ring setting. Each of our yellow diamond engagement ring settings is manufactured to feature an 18 karat yellow gold cup, which enhances the color of the center diamond. The current price of these settings does not factor in the cost of a center diamond. If you own a fancy yellow diamond already, we simply need to know the measurements of the stone. If you do not own a center stone already, you may request a complimentary a personal diamond shopper from deBebians. 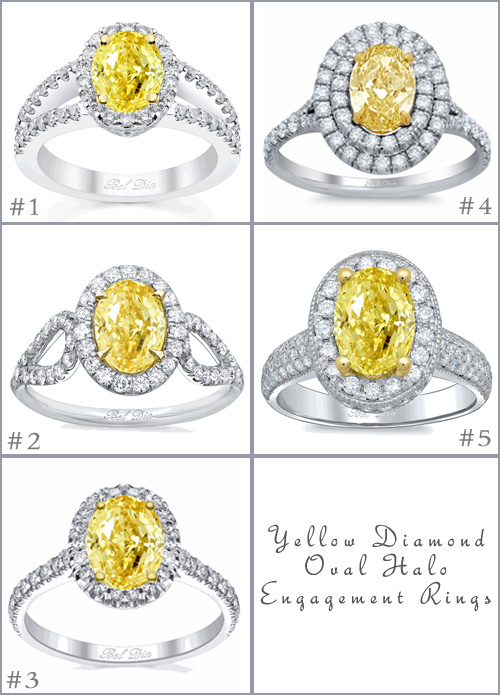 I am highlighting our yellow diamond oval engagement rings that we currently have available. To learn more about each setting, please click on the photo or the link below to be taken to the product page. If you are interested in creating an engagement ring for a fancy yellow diamond with our jewelry designers, please fill out our form to request a custom jewelry quote, which is complimentary. We specialize in creating bespoke jewelry of all kinds, including engagement rings, wedding bands, and more.